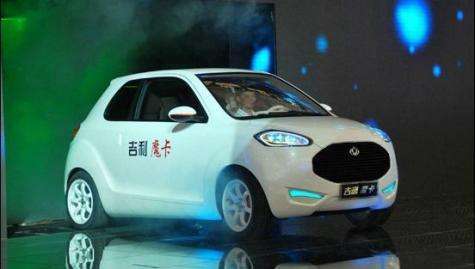 (PhysOrg.com) -- Geely, an automotive manufacturer that is based in China, has created a new vehicle called McCar. Aside from creating a lot of Batman movie comparisons and jokes, it truly is an amazing vehicle. The McCar, which is not named for a famous sandwich created by a fast food chain that uses a clown as it mascot, is a hybrid car that is paired with a scooter in the rear. While this combination is a bit unusual, it provides the maximum in driver flexibility. 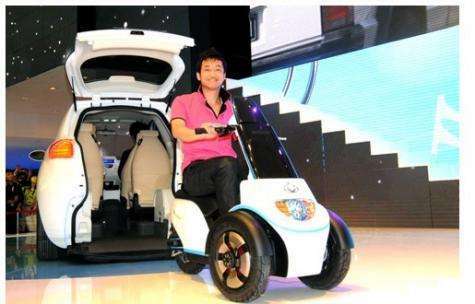 The McCar was recently shown off to the public at Auto Shanghai auto show this week. 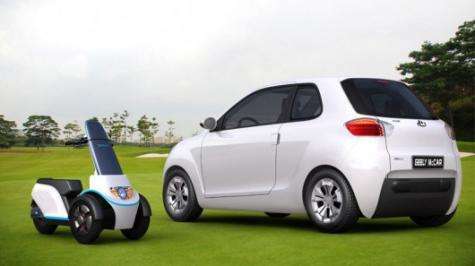 The McCar is an ultra compact, two-door model with four-seats. The folding scooter in the back is entirely electric and has three wheels. Storing a bike in a car is nothing new, what makes the McCar unique is the fact that it can actually generate electricity with the movement of the car. 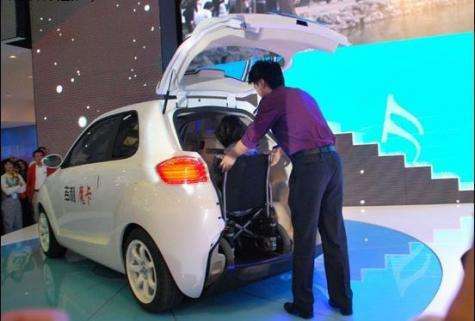 The electricity can then be used to charge the electric scooter while it is docked in the trunk of the car. So, how could car could be greener than this? Since the main vehicle gives drivers a choice of a gas-electric hybrid or fully electric car, it really can't. The McCar electric version features a 12kWh battery, which has a range of roughly 93 miles. This car will no doubt be for mostly city driving, since it has a top speed of only 52mp. Recharge time on the McCar's battery is roughly six hours, which puts it ahead of some larger electronic cars. The hybrid version features a 8kWh battery that can run roughly 31 miles on electric power and up to 373 miles on a combination of gasoline and battery life, with a top speed of 80mph, which makes it the choice for longer trips. The hybrid is also good for impatient chargers, since it takes only two hours to recharge. The cars scooter has a range of 18 miles and a top speed of 18 miles per hour. Like the hybrid vehicle the scooter takes two hours to charge. Since this part charges while you drive, you won't really have to wait. Official word has not been given yet on when this car will be available to the public, what markets it will be made available to, or what the car will cost. It does not take a brain surgeon to figure out that the car will be available in China, but who knows what other markets the McCar will find its way into. What are those things on either side of the scooter? Are they seats or are they arm rest? I can't imagine anyone old enough not to require a car seat being able to squeeze into those seats. And it doesn't look like car seats would fit either. I don't understand the innovation here. The scooter charges/leaches off of the electric car's battery while driving? Lots of innovation in the transportation sector from everywhere, accept the failed American Nation. Dude, here: http://venturebea...he-road/ See if you cannot find ONE American made auto in just this list of over two dozen. NO, they are NOT all American, BUT THEY ARE CERTAINLY NOT, NOT, all Chinese, or Korean, OR whatever else the heck you love that comes from 'Over There, somewhere, else' and you KNOW better. "Except" not "Accept". Angry dog always barking at the moon. All bark, no bite. Illogical Failure. 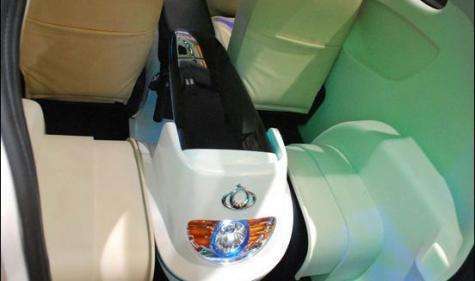 @ Vendicar_Decarian, when you look at the fourth pic it clearly shows the back of a couple of what must be very narrow seats. I cannot think of any accept,I mean except the most petite adult being able to fit their arse in those seats! Yes, thank the socialist Regulatory State and high taxes. How much more will this vehicle cost and weigh to meet USA safety standards? Speaking of transportation innovation, "Now you can streamline your flying experience with the revolutionary integration of personal land and air travel made possible by the Transition® Roadable Aircraft. " Of course neither of your flying cars are usable anywhere outside of a salt flat in the US. There's a reason why there are regulations on cars, it's so you don't easily die when you use them. Those same safety regulation do not apply to motorcycles. The roadblock to flying cars in the USA is the FAA. But the FAA can't keep their air traffic controllers awake how can they regulate flying cars? The roadblock to flying cars is that people can't stand to follow the rules when they drive resulting in numerous deaths each year. Flying is exponentially more difficult. And that's before we even begin to talk about fuel costs. "The AGATE Consortium is a unique partnership between government, industry, and academia established to develop new ways of reviving the troubled general aviation industry. " "SATS is a five-year, public-private research partnership between NASA, FAA and the National Consortium for Aviation Mobility. " "The AGATE Consortium is a unique partnership between government, industry, and academia established to develop new ways of reviving the troubled general aviation industry." Manchester Airport, Nashua Airport and Concord Airport for starters, all local to you. Asians are starting to get ahead on the rest of the world now. As for auto safety standards, US expats who wanted to purchase a new Volvo at the factory to save money couldn't purchase a model made to Swedish safety standards. They had to purchase one made to US 'standards'. Does this have to do with safety or to protect markets. The SMART car had similar issues and most European diesels are not available in the US. Asians have been ahead of the ROW for quite some time. You've been wrong about the 'regulatory state' in every post you've made on this site, what makes you think that anyone cares about your jabber?